I found this book really helpful during my MSc assignments, group project and thesis project. 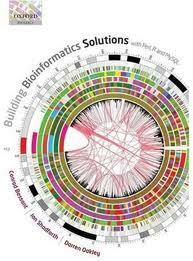 It gives a nice informative introduction for each tool then works through towards developing advanced bioinformatics applications. This book presents a well-written and complete overview of bioinformatics software development using Perl, R and MySQL. The book is divided into 5 chapters. The first chapter begins with an interesting introduction on various bioinformatics resources and applications. This is followed by useful and descriptive chapters on MySQL, Perl, R and web programming. A highlight of the book is it’s well-structured layout. For each chapter, there is easy introduction followed by concise explanations to developing advanced bioinformatics applications and well commented examples of code plus accompanying online resources on it’s website. As this book is titled “Building Bioinformatics Solutions: with Perl, R and MySQL”, and it does cover its ground very well, plus there is no assumtion of prior knowledge on software development – hence, it is also suitable for those with minimal programming experience. In conclusion, this book is a very valuable resource for software development in bioinformatics, both for those that are already working in this domain and for those desiring to do so. It is also appropriate as a general introduction into the area of bioinformatics for interested and literate non-specialists. EUtilities is a very useful resource to retrieve data from NCBI database. This script retrieves a brief summary and the genbank file for genes that are relevant to a search word. There is also an option to limit you number of results returns (very handy). Bio::DB::EUtilities is required to execute the search. This method is much faster than using Bio::DB::Query::GenBank module. If you require more information than the summary output, you can always get it from the genbank file. The summary does not provide information such as references and sequences. Chapter 10 of ‘Beginning Perl for Bioinformatics’ is a good and simple reference for retrieving data from from files in genbank format. This resource is freely available here. Installing new modules: this can be easily done using cpan. Here is the documentation for cpan. Or, here is documentation for installing modules manually. This script retrieves the full articles (or the abstract if the full article are not available) that a relevant to a search term from the PubmedCentral (pmc) database. The results are sorted in reverse chronological order. The output is in xml format. LWP::Simple is required to execute the search.